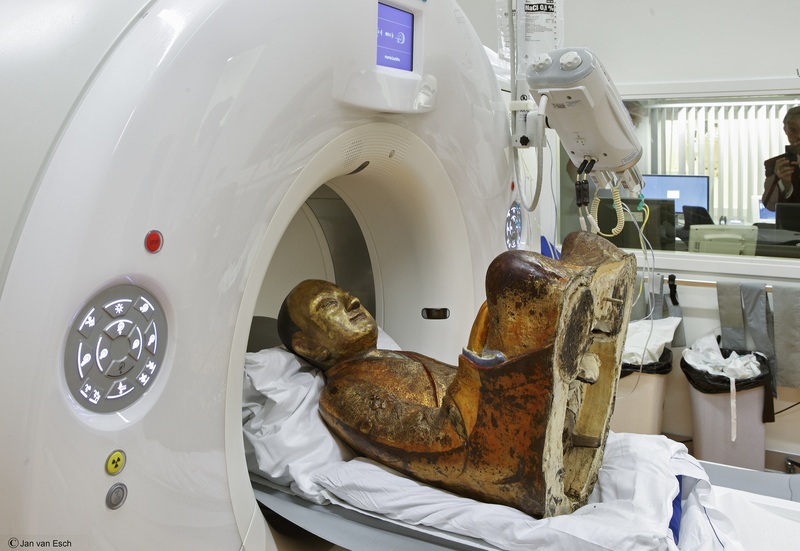 A 11th or 12th century statue of a meditating Buddha with a perfectly posed mummy inside received a revelatory CT scan last September at the Meander Medical Center in Amersfoort, central Netherlands. 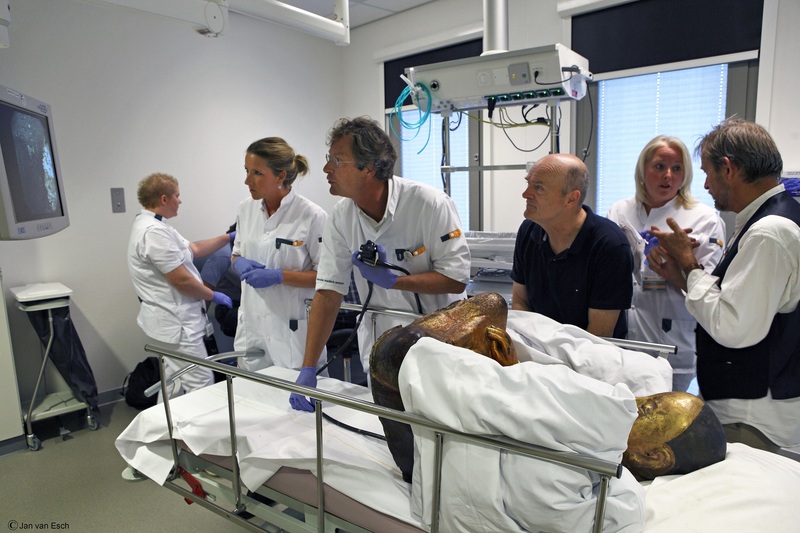 The statue arrived in the country as part of the Mummies exhibition at the Drents Museum in Assen, northeastern Netherlands. This was the first time the reliquary was allowed to leave China and it’s the only Chinese Buddhist mummy that has ever been made available for scientific research in the West. The exhibition ran from May to August, after which the statue was taken to the medical center for CT scanning by Buddhist art expert Erik Brujin. 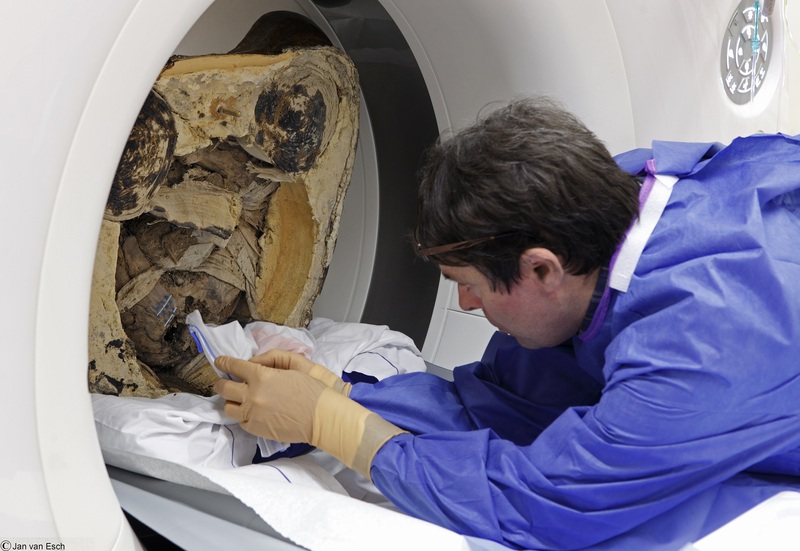 Under the careful supervision of Brujin, radiologist Ben Heggelman ran the statue on its back through the CT scanner and took samples of bone tissue for DNA analysis. Gastrointestinal and liver disease specialist Raynald Vermeijden used an endoscope to sample material of an unknown nature from the mummy’s thoracic and abdominal cavities. Several news stories have incorrectly described the mummy as a shocking discovery, but it was known to be inside the statue all along. Not to state the obvious, but that’s why it was sent to the Drents Museum in the first place as part of the Mummies exhibition. The research team did make one surprise find: the cavities where the organs once resided are stuffed with pieces of paper that have ancient Chinese characters written on them. The mummy is believed to be that of the Master Liuquan of the Chinese Meditation School, or Ch’an (known as Zen in Japan) Buddhism. He died around 1100 A.D., which is the source of the date for the statue. The Drents Museum exhibited the statue as an example of self-mummification, a grueling, torturous, years-long process in which Buddhist monks gradually starved, dehydrated and poisoned themselves in the hope of attaining enlightenment and leaving an incorruptible corpse. It required an almost inconceivable degree of self-abnegation. For the first 1,000 days they ate only nuts and seeds gleaned from the area around the temple. The next 1,000 days the diet was whittled down to small portions of pine bark and roots until the end of the period when they began to drink a tea made from the sap of urushi tree. This sap is what lacquer is made of; it is toxic to humans. The tea induced the release of fluids and made the body unappetizing to insects and microorganisms that would otherwise be inclined feast on the corpse. With no body fat or fluids left and poison in his tissues, the monk would then be walled alive in a room that gave him just enough space to sit lotus style. A tube let air into the tight space and the monk would ring a bell to let people know he was still alive. When the bell stopped ringing, the tube was removed and the space sealed for another three years. When the 1,000 days were up, the tomb would be opened to see if the body was in fact mummified. If it wasn’t, and most of them weren’t, it was buried with due respect for the unbelievable toughness and devotion of the priest who made the attempt. If it was, the deceased would no longer be considered dead but in a state of eternal meditation, removed from the cycle of Samsara. He was elevated to the rank of Buddha, his mummy dressed and decorated and placed on an altar. The practice as described above was codified by Kuukai of Mount Koya, Japan, founder of the Shingon sect of Buddhism. He is thought to have learned it while studying esoteric Buddhist practices in the T’ang region of China. 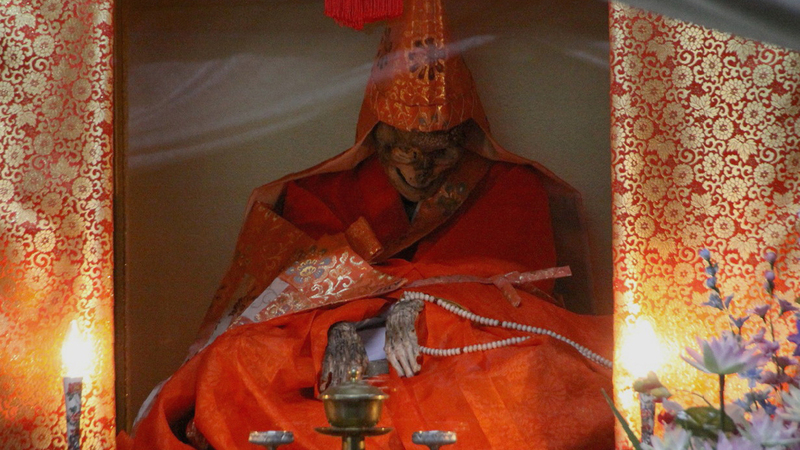 Most examples of self-mummification have been found in the Yamagata Prefecture in Japan, but there are instances in China and India as well. The thing is, there is no removal of organs in this procedure. 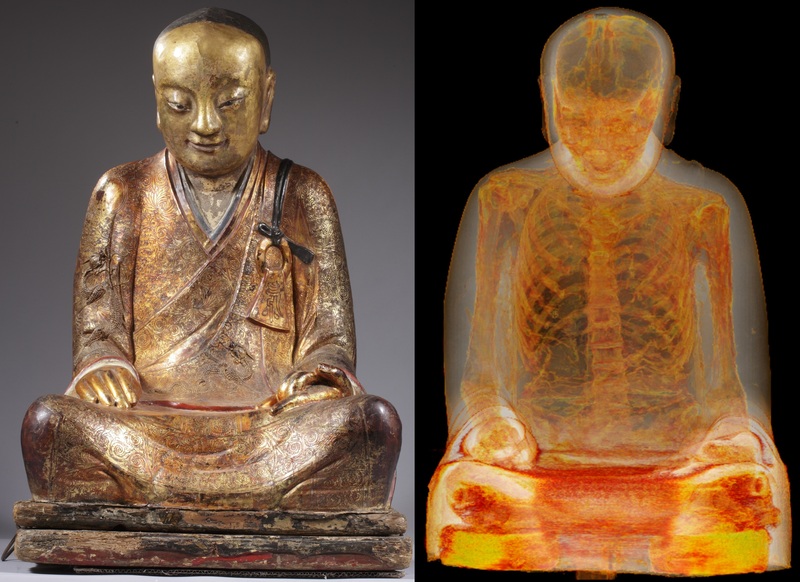 If the mummy in the Buddha statue did indeed self-mummify, his organs must have been removed after death, and I can’t see how it could have been done three years later. There’s a different process at work in the Buddha statue mummy. I hope the scan and tests will get some answers about how he died and was mummified. The results of the research will be published in a monograph at an unscheduled future date. The exhibition is now in the Hungarian Natural History Museum where it will remain until May. After that it will travel to Luxembourg, Germany, Switzerland, Austria, and Sweden concluding in Wales in 2018. This entry was posted on Monday, February 23rd, 2015 at 5:42 AM	and is filed under Medieval, Modern(ish), Museums. You can follow any responses to this entry through the RSS 2.0 feed. You can skip to the end and leave a response. Pinging is currently not allowed. Magnificent. I wonder what was inside the stuffed paper. Has that been revealed yet? What terrible torture to one’s own body. Were details given about that coffin ? How was this -apparently conventionally- mummified body put inside ? As I know of a case, where the coffin is almost 600 years younger: Could it be considerably younger than 11th century ? Furthermore, one might wonder -at least from a Buddhist point of view, of course- if ‘self-mummification attempts’ manifest an act of hypocrite selfishness, a form of betrayal to all forms of sarcophagic insects and other animals. It is stuff like this that makes history so marvelous. Loved this article, how educational. I just wish we can have them visit Montreal as well like the Bodies Alive – Dr. Gunther exhibition did. a lot of of people in the East guzzle descending green tea each day which may seem like a really unknown perceive to most Westerners. Studies on this specific liquid help the many health praises that green tea receives each day. Cancer is among the highest death of people in the United States. Various statues and mummified process reflect some similarities with ancient religious practice. Buddhism is an extension of the Hindu religion, which tradition was carried to India by the Aryans. Ancient religions are all born from fear to faith.